In his work on celebrity, Daniel Boorstin drew a firm line under a field that has since become the mirror of its own study, in industry within media studies. The modern celebrity, he surmised, is “well-known for their own well-knownness”. The celebrity as criminal came later, but was nonetheless an outgrowth of the same aspect, boosted, in no small part, by curiosity and plain voyeurism. 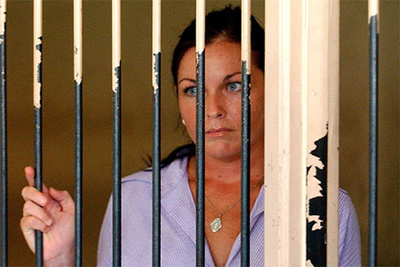 Australia’s Schapelle Corby, to take one example in this dubious pantheon of figures, found herself swept up in a heady discourse of rage and presumption once she was intercepted at Ngurah Rai International Airport in Denpasar on October 8, 2004. She had, in her possession, 4.2 kilos of cannabis concealed in a carry bag designed for holding surfboards. In May 2005, she was found guilty of drug importation, receiving a 20 year sentence instead of the more conclusive ending of a firing squad. Former Indonesian president Susilo Bambang Yudhoyono shaved five years off her sentence, accepting grounds of mental illness. In February 2014, she was granted conditional parole and released, remaining in Indonesia till this month. Even now, the media vultures ponder her next move on Australian soil. Will she give an exclusive? Will she defy criminal restrictions on charging for any story she might divulge? For now, the Courier Mail is keen to announce that she is being protected by that “bodyguard to the stars” John McCleod, whose credits including protecting “the Dalia Lama, Lady Gaga and Roger Federer”. What Corby became, over time, was an encoded, cultural message, cipher to frustration, indignation and a pulpit for the irate sermon. She was deemed pretty. Her tear ducts worked with intensity, her face a mess of manicured grief. Her audience was polarised, though a Morgan poll taken a week after her conviction suggested that 51 percent of Australians thought her innocent. With the Internet in 2005 already a phenomenon of viral intensity, spreading messages and anger at speed, sympathy for Corby became a matter of patriotic necessity. That Indonesia had a separation of powers doctrine that prevented the government from directly tampering with a judicial verdict was an inconvenient fact: surely third world countries did that sort of thing with casual indifference. And the trial should have been conducted in English! The Corby campaign soon realised the potency of focusing on the Indonesian justice system, and Indonesians in general, capitalising, to no small extent, on the trauma of the Bali bombings of October 2002 where 88 of the 202 killed were Australians. Fantasies of violence, usually directed against Indonesians, became the norm. Prosecutor Ida Bagus Wiswantanu became a conspicuous target. Bloggers came with various suggestions verging on lunacy, many not falling that far short of military intervention, assisted by Australia’s elite SAS force. Tongues wagged; rumours swirled, and the report by the Northern Territory Deputy Coroner Elizabeth Morris in 2012 eventually concluded that the dingo most probably did it. All other “reasonable possibilities” had been excluded. Location, padded with meaning, is all important in this. Each incident had its sizzling site, its capturing mystery. In the case of Azaria’s disappearance, there was the demon fanged dingo lurking in hostile territory, the dreaded, swallowing Australian interior; in the case of Corby, her actions took place in Bali, a place feminist Anne Summers has rightly noted to be “a tropical paradise that has served as a national balm” for Australians. The Corby phenomenon also edged its way into gender narratives, with notions of “gender-inflicted media messages” that prove almost assaulting in their quality. Scholars wishing to make their mark in the crowded field of deviant discourse have suggested that the treatment of Corby heralded a new species of criminal: the “deviant diva”. Transgression could be linked, not merely to the crime committed, but gender. Mangled terms of heavy clunk have been introduced, including that advanced by Belinda Middleweek: the “celebrified criminal”. Ultimately, one feels for such rarefied, categorised figures. They erred, but became conduits for parochial indignation. Even now, journalists such as Larry Pickering insist on holding the torch with zeal, noting such “anomalies” as “AFP involvement and missing CCTV tapes from three separate airports.” Ordinary folly becomes a matter of heroic tragedy rather than bungled miscalculation. Idiocy assumes the form of idealised innocence writ large. Such is the lot of the modern deviant diva.